A short-form description of the Renaissance often centres around the rebirth of the classical tradition, drawing on the forms and ideas of ancient Greece and Rome. In addition to this, the vital transmission of text and imagery from antiquity was enabled by works produced during the Middle Ages, some of which drew upon antique sources. Among the more significant Medieval literary contributions enabling this reconnection with antiquity are the works of Dante Alighieri. His most well-known and influential work is the Divine Comedy. Describing Dante's travels through Hell, Purgatory and Heaven, the Divine Comedy is primarily regarded as a theological allegory, mixing both classical and contemporary references. Dante's guide for much of the journey in the Divine Comedy is the Ancient Roman poet Virgil, best known for his epic Aeneid, and later regarded by Christian scholars as an honorable pagan for works such as the Fourth Eclogue, which some interpret as containing pre-Christian ideas and messianic prophecy. When studying the art and literature of the Renaissance, a familiarity with Dante can enrich our understanding of the era. Dante is usually depicted wearing red stylised Medieval clothing, often accompanied by Virgil in key works, such as Raphael's Parnassus and La Disputa (without Virgil in the latter). 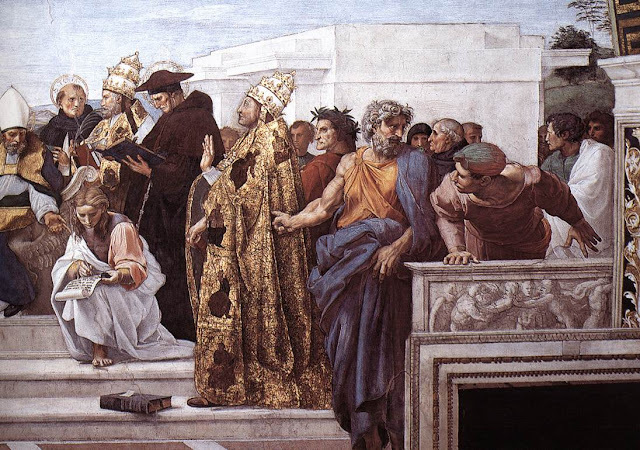 In each of these scenes, Dante's enduring contributions to literature and theology are celebrated. The veracity of this account is of course contestable, and is often regarded as an illustration of Michelangelo's erratic and antisocial nature. Despite this, the writings of Dante were a feasible topic of discussion in artists' circles. Unlike many of the classical and medieval writings in Greek and Latin being revisited by scholars during the Renaissance, the Divine Comedy was available in the Tuscan dialect, a precursor of modern Italian. Its language would have been more familiar and accessible to the artisan class. 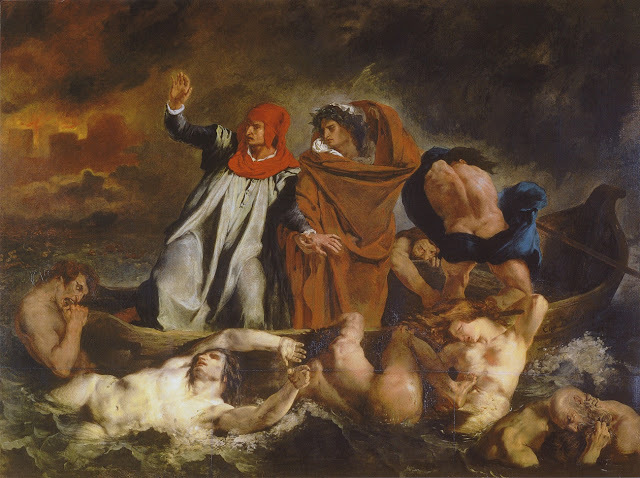 Delacroix' nightmarish vision of the boat ride described in Dante's Inferno. The Florens 2012 conference presented another opportunity to explore the enduring influence of Dante with the panel "Dante in the 21st century: on the page, the stage and the web", organised by the Società Dantesca Italiana (Italian Dante Society). The seminar is projected towards 2015, the year of the 750th anniversary of the birth of Dante, and analyses the central role of Dante in contemporary culture: it examines the importance that cultures around the world attach to Dante, and the international role of the Italian Dante Society, a distinguished Florentine academy with numerous scientific and cultural events, and which is exemplified by the presentation of their website, www.leggeredante.it, on which readings of Dante by the greatest Italian actors are available, organised in the past year by the Teatro della Pergola, the Dante Society and by the University of Florence. Furthermore, the initiative “Suddenly Dante. 100 songs for Florence“, will finally be presented. This is an initiative which has involved many readers for many years on the streets of the city. Unfortunately, this panel did not have English translation, so was not attended directly. 3PP was able to secure some time with Dr. Eugenio Giani, a prominent Florentine public figure, and also head of the Italian Dante Society. Dr. Giani was very generous with his time, allowing near a half-hour in his office within the Palazzo Vecchio. We discussed the origins and mission of the Italian Dante Society - an assemblage of prominent Dante scholars who gather the various extant manuscripts from the middle ages and beyond and piece together definitive compilations of Dante's works, known as "National Editions". It is these compilations which become the template from which other publishers derive their editions. The National Edition of the Complete Works was cited as the most definitive version to date, though work was ongoing on critical revisions (Testo Critico) of pieces such as the Divine Comedy and La Vita Nuova, based on updated scholarly discourse and manuscript evidence. Dr. Giani further elaborated on the work being done in preparation for the 2015 Dante Society seminar, which aims to establish a more complete description of Dante, beyond the literary figure he is popularly regarded as. Earlier that morning, Dr. Giani had shown us a central ceiling panel in the Salone dei Cinquecento at the Palazzo Vecchio, attributed to Vasari's workshop. 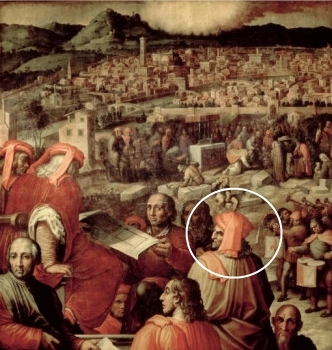 It is known in English as the Expansion of Florence, and depicts Dante in his role in urban planner, overseeing the revision of the city's boundaries. 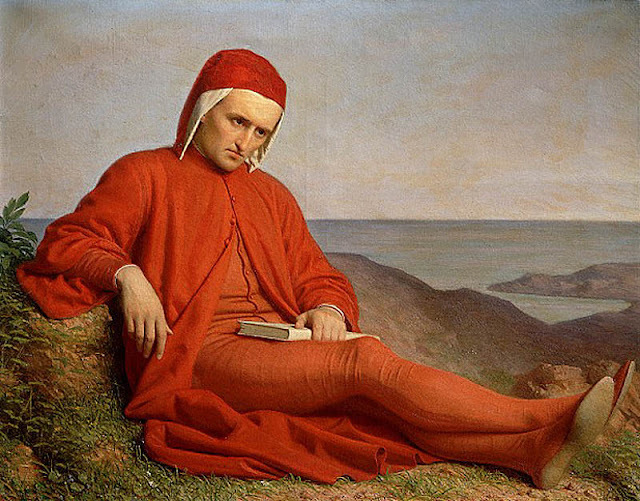 It provided an apt illustration of the aim of the 2015 conference to define the broader influence of Dante as an active civic and political figure. Dr. Giani also touched upon the aims of the website, leggeredante, which features actors' readings of Dante since 2006. The aim of this project was to reconnect people with the tradition of live poetry readings, with the corresponding website intended to be a record of these events. The site is a well designed archive of the readings, with videos going back to 2006. To further align with the stated "international role" of the Italian Dante Society, multilingual options for the site and videos would have been a bonus, such as seen on the Dante Online website (link) Those interested in another quality online resource on Dante are also reminded of the Princeton Dante Project website (link). Looking forward to the 2015 Dante Society conference, we can only hope that an international presence is embraced, including providing for simulcast translations, which were not available for this panel at Florens 2012. Many thanks to Dr. Eugenio Giani from the Italian Dante Society for his time and patience, and to Melissa Pignatelli from La Rivista Culturale (an impressive cultural magazine website in three languages incl. English), who provided much needed language assistance during the interview. 1. Benko, S. Virgil's Fourth Eclogue in Christian Interpretation. Aufstieg und Niedergang der römischen Welt 2.31.1 (1980): 646-705. 2. Sourced via Richter, I. The Notebooks of Leonardo da Vinci, Oxford University Press. 1952. p.356. What a missed opportunity for the Societa Dantesca... to have 3PP eagerly awaiting to cover the panel in its characteristic detail (as in Madrid) and to not have splurged on translation! I am please you got to interview Mr. Giani, Hasan. As he took you into his office rather than gave you an "on the spot" I can only imagine he was impressed by at least the look of you! That the discussion lasted for upwards of 20 minutes in the midst of busy politician's life makes me feel that you successfully got his attention. I would have enjoyed to see how you tackled this. Kudos to Melissa for helping you. Bravo. To watch you extend your reach, and share it here for all to see is quite something. Hi Stephanie! A gracious thank you for your kind comments at 3PP over the years. You seem ever-present and positive - a blessing for any blogger. This encounter made me think about interviews and engaging people in person, which is what I am most used to in my role as a clinician, and am eager to make a transition to at some point with this activity. Time will tell. I find it a bit ironic that the panel was organised around 'the importance that cultures around the world attach to Dante' and yet it did not have English translations. I can understand how discussing Dante in a different language is not ideal as the language is such an integral part of the work but even I cannot fully comprehend it in its original format and I happen to speak Italian quite well. I hate to complain but this is one of those annoying things that Firenze just does a lot (like not providing materials in other languages). I was very eager to learn about this whole conference in the first place, hoping Firenze might open up to the web and maybe starting to embrace outsiders and not just 'tolerate' the flow of tourists and 'stranieri'. Which is what I think they do at best. Baby steps. Thanks again for your posts from this conference! I always learn something from reading your posts :) I had the opportunity to study Dante in college in a Medieval literature and history course. How interesting to see more about his role in Florence's history and to see how it is being celebrated today. Looking forward to more from the 2015 events. Perhaps you will be there? @Susan - that was my feeling exactly! This was one of the Florens 2012 events that I was eagerly awaiting - I was saddened to miss it. It was a relief to be able to generate something out of the opportunity by being able to meet Mr. Giani. I really do hope that more consideration is given to this "international" profile in 2015, the 750th anniversary is a major milestone. @Jenna - welcome back to 3PP! I'm intrigued to hear you have studied Dante in the past. I have done this as well, and in my case it was one of my earliest connections to Florence, long before my exposure to the art of the Renaissance. Hasan--Eugenio Giani was exactly the right person for you to interview in Florence, since he is a serious individual who is deeply committed to broadening access to culture while maintaining high standards. I do hope that he follows up on your suggestion regarding simultaneous translation at future events. It does seem like the sort of thing that he would focus on. Ed G.
It has been pleasant to watch you Hasan, as you report by tweet and blog from the Florens event. One day your time will come to contribute to these discussions, now still controlled by old men with no ideas. Giani is an exception, a very interesting man, with many accomplishments and connections. I am not suprised he gave you so much time. I wonder what you asked him to provoke this. Amazing! Excellent! I am not suprised. Eugenio Giani was the perfect person for you to meet Hasan, as Edward Goldberg has said. I also wonder what you asked him. Having met you briefly at the Raphael exhibition in Madrid, I do remember it is easy to lose track of time communicating with you. I do also wish the 2015 seminar welcomes international interest, Dante is loved by many worldwide. @Mauro - thank you for the feedback. I am simply pleased that items presented at 3PP continue to be of interest to more readers. @Genevieve! I recall our lengthy chat in front of Santa Cecilia! Welcome to 3PP. I agree that appreciation of Dante, at any level, transcends any one language or region - as with any good literature. with illustrations of Dante's works by Gustave Doré, Botticelli, Dali (the link, however,is a bit strange)and Evelyn Paul. Of course, there must be many more artists who illustrated Dante's works. Interesting and very special is also the section 'maps', by various artists, of the Inferno, Purgatory and Paradise. Fantasy without limits! Hello Bender - many thanks for your comment!